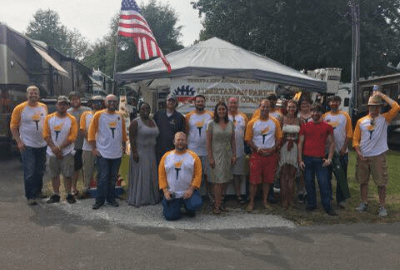 “The Libertarian Party of Kentucky is pleased to be part of Fancy Farm again this year,” says Libertarian Party of Kentucky’s (LPKY) State Chair, Harlen Compton. Libertarian National Committee (LNC) Chair Nicholas Sarwark is speaking on behalf of the LPKY this year at the annual picnic. Known in political circles for his quick wit and political “savagery”, Sarwark will surely fit right in among the ranks of bombastic Republican and Democratic speakers. Fancy Farm is the largest political event in Kentucky and is known for its brazen rhetoric. Held in the unique township of Fancy Farm, KY in Graves County, this year the picnic takes place on August 5th. The LPKY will be hosting a “Night Before” fundraising dinner with Sarwark on August 4th at Carr’s Steakhouse in nearby Mayfield, beginning at 7pm CDT. Sarwark, who will be traveling from his home in Arizona, has served as chairman of the LNC since 2014. He has a law degree from American University and an undergraduate degree in computer science from Columbia Union College. In Kentucky alone there are over 2000 positions up for reelection in 2018. LPKY members and leadership rallied together in 2016 to help the Johnson/Weld campaign garner over two percent of the statewide vote, demonstrating the mandated “modicum of support” required by the Commonwealth. This success, coupled with the efforts of those who gathered petition signatures, has ensured ballot access across the state for Libertarian candidates. Until 2020, the LPKY has the groundbreaking opportunity to put candidates on the ballots in far greater numbers than ever before. For more information about LPKY activities across the state, more information about the Fancy Farm events, or to purchase tickets to those events, visit their website at www.LPKY.org.